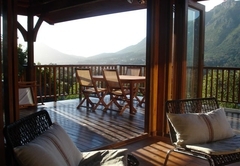 Blackwood Log Cabin is a highly recommended property providing self catering in Hout Bay for up to 4 guests visiting the Atlantic Seaboard region. 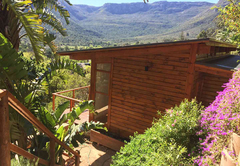 A tranquil mountain retreat where the forest and mountains will re-awaken the soul - Blackwood Log Cabin is a self-catering log cabin that sleeps four with a swimming pool, trampoline and large sun-deck. 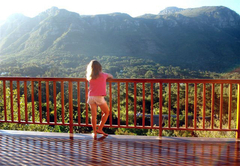 Set high on the mountain slopes of Hout Bay with panoramic views across the lush valley to the mountains of the 12 Apostles, blackwood log cabin clasps the side of the mountain like an eagles nest. Tranquil and quiet, here you can simply be in and appreciate nature. This 2 bedroom, 2 bathroom home, complete with swimming pool, open plan lounge, dining area and kitchen, has foldaway glass doors opening onto the sundeck. Here you can watch the valley where the eagles like to soar. The enormous windows let in an abundance of natural light during the day and a canopy of stars at night. The dramatic sunsets tint the sky from dusty pinks to fiery reds. 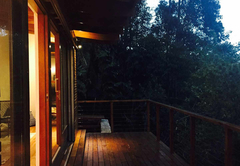 The cabin is set in two acres of indigenous garden and forest with rock formations, wild flowers and Koi fish ponds. The natural swimming pool, low slung hammocks and trampoline, make it the perfect natural playground for children. 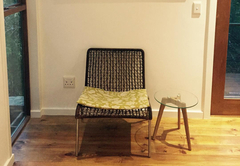 This warm, welcoming home is perfectly positioned for exploring the peninsula and the city. It is only minutes away from the beach, restaurants and cafes. The V&A Waterfront and the Table Mountain Cable car are 20 minutes away along a beautiful scenic drive. The Constantia Winelands and Kirstenbosch Botanical Gardens are less than a 5 minute drive away. The main bedroom has a queen bed and glass sliding doors that lead onto a private covered deck with a hammock and chairs. The two large windows look out to the mountains from where the sun and the moon rise. 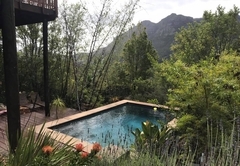 A Victorian bath placed in the corner offers beautiful views to the forest and mountain peaks. A toilet and basin complete the en-suite bathroom. The second bedroom has twin beds and glass sliding doors that open up onto the main deck. The large window looks past the yellow wood tree and beyond to the mountains where the sun sets. The second bathroom has a walk in rain shower with a large window looking into the yellowwood tree. The wooden basin and toilet complete the bathroom. 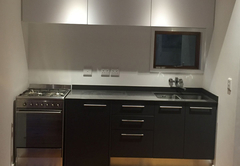 The kitchen is spacious and elegant. 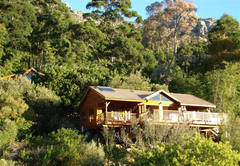 It is well equipped with a glass top stove and oven, fridge, dishwasher and microwave. All cooking utensils, crockery and glassware are fit for entertaining guests. The Lounge is elegant with high ceilings and hanging lampshades that mimic silk woven cocoons. 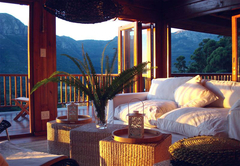 The lounge extends onto the deck with foldaway glass doors on three sides that opens it up to the valley and the mountains. The deck has wooden table and chairs for the inevitable el-fresco dining and evening drinks. There is a barbeque for cooking on the open fire. 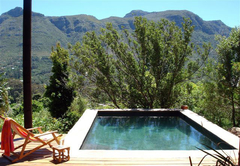 The swimming pool is deep and playful and a wonderful place to soak up the African sun. The furnishings are organic and textures are of the earth: linen, cottons, sea grass, raffia, sisal, bamboo, knotted leather and sea shells. The hanging lamp shades mimic silk spun cocoons. 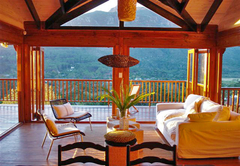 The organic connection is not limited to the furnishings; the walls and floors are treated with plant oil on the inside and the house uses the African sun as its source of energy. 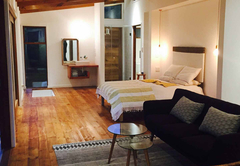 The log Cabin has 2 bedrooms, one queen room and one twin room. We had the most amaizing time and the most amazing view. I would definitely recmmend this place to anyone. The pictures don't do the place justice.